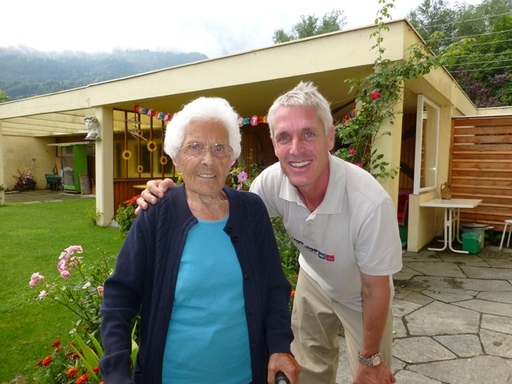 Darrio's grandmother "Nona" passed away on the 3rd of September at 4.23 h. She was healthy till the end and was with 101 years our oldest member. The funeral will take place on the 6th of September at 14h at the ref. church in Landquart, Switzerland. Dario's number is +41 81 723 39 77. This next expedition report will be a longer one because a lot of things have happened in the last past month. It tells you about the journey from Whittier to Cordova, where we decided to overwinter the boat. After we left Whittier, we had to put on our warmest clothes because it became colder, especially when we visited Columbia Glacier, one of the largest glaciers from Prince William Sound. It was breathtaking and quite adventorous, because we had to be very careful not to hit an iceblock on our way. 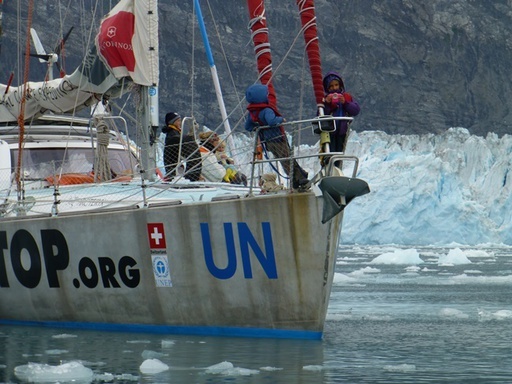 On our map, Pachamama was „on" the glacier, because a few years ago, the glacier used to be a lot bigger. After this experience, we anchored twice in a nice bay before we made our way to Cordova. 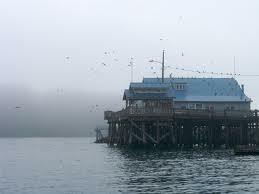 Cordova is a small fisherman's town, cutt off from Alaska's road system and surrounded by mountains, close to the Copper River Delta. We struggled with the decicion, whether to sail or not to sail further south to Juneau. Because of the wheather, that could be very unpredictible in the Golf of Alaska and upcoming storms, we decided to stay in Cordova, where everyone felt at ease. We were lucky to have a presentation at the film festival in town. We met a lot of very nice people. For example Anita and Dana Smyke, that took us for a hike to crater lake a few days later. 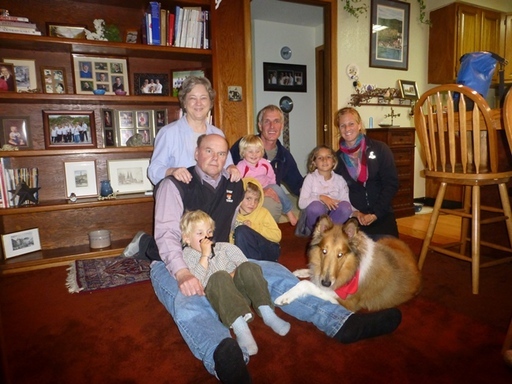 Anita and Dana both work for the forest service in town and became good friends of us. On another sunny day, Nikolai, Helen and Dario joined Anita for a Hike on the Power Creek Trail. We came across a lot of beartracks. Bears like this trail because of ist richness of berries. Nikolai and Dario were ready for a challenge, so they left the group and hiked / run back to town over the Alice Smith ridge route and Mount Eyak (12 miles of steep terrain), Helen went blueberrypicking instead. Salina and Andri are now going to the public school in Cordova, which they both like a lot. They enjoy being around other children and they both take swimclasses. Andri is very happy that he can finally learn to play the violin and Salina impresses us with her balletmoves she has learned in the ballet class she goes once a week. Noé and Alegra can go playing in the gym, that is reserved for children of their age three times a week and use another offers for small children the town offers. 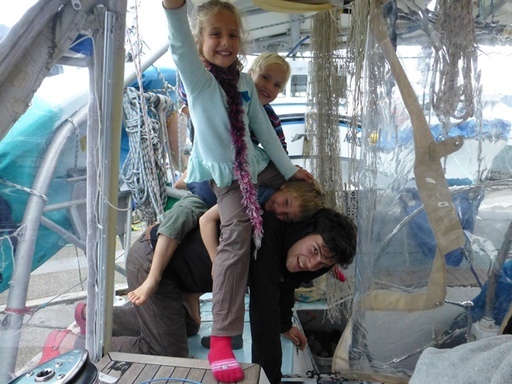 For Nikolai, the opportunity came up to join a fisherboat, going south to Seattle. He took the chance and so we had to say goodbye to him. He was on Pachamama for 2 months and always keen to improve his sailing skills. Nikolai helped wherever he could and we enjoyed a lot of funny moments with him. Nikolai, you were SENSA. Not much after Nikolai, Dario had to leave too because his grandmother was dying in Switzerland. What we were told: „At this river, EVERYONE catches fish, it's really easy". 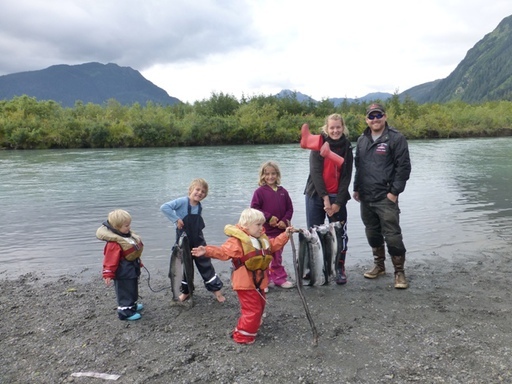 We met Ryan Asa, a captain from a fisherboat, who took us (Sabine, Helen and the kids) out for salmon fishing at the nearby river. So we tried our luck. On the first day, Ryan was the only one the caught a fish. Thanks to Salina, we received another one from another fisherman, who caught too many fish (everyone is only allowed to catch three fish). On the next day, it was again only Ryan that caught one salmon, but this time, it seemed like everyone arround us was catching fish all the time. So we ended up going home with 10 beautiful silver salmon, which was good to get over the frustrating fact, that we're maybe not born as fishermen. 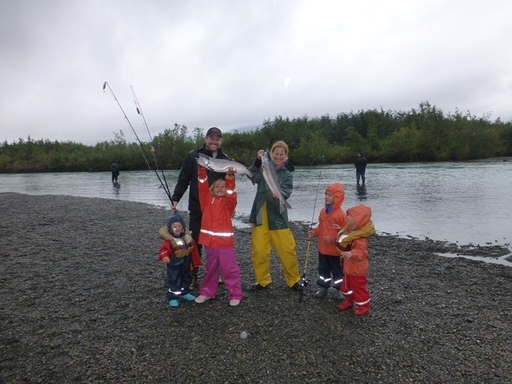 Nevertheless, we had a lot of fun fishing and even more fun in the evening, when we prepared and ate the tasty, super fresh, Alaskan salmon. There's no bad weather, only bad clothes! Sometimes we wondered, why we haven't seen any people with umbrellas in town. We knew the answer now: It's useless! The upcoming week, we experienced what Alaskan weather was like! We had heavy rain, compared with a cold wind, which often made the rain coming sideways. In the salvation army shop we bought new raingear that helped us to stay more or less dry. It's mushroom time in Alaska and there was a whole festival to celebrate it. We went mushroom hunting too and came back with a bunch of „Angel wings" and „Hedgehogs", that Marc, an originally Swiss fisherman, showed us how to cook. With a whole group of mum's we went on another hike through cottonwoods and spruce, emerging at Saddlebag Lake with a glacier in the back. On our way to the trailhead, we saw a little bear on the other side of a fishing river. After having spent 10 days in Switzerland, Dario returned to Alaska and stopped at SGS in Anchorage to give a presentation. The day after his arrival, he gave a presentation at a potluck lunch from Cordova's homeschool programm. It's very common to homeschool the children here and it was very interesting to meet these people and talk about their reasons why they do it. On the weekend, Dario went out to help Dana carrying back a moose, which he had shot the day before. Unfortunately, they couldn't find the moose anymore. Hunting is very common in Cordova. A lot of people hunt to provide their families with fresh meat during the winter. Whilst Dario was hunting, the rest of us hiked up to the waterreservoir, that is Cordova's water supply. Our friend Molly with her son Sully came with us. The next day, we hiked once again with a big group of people to lake Elsener. It wasn't the easiest track. Sometimes, there were little streams where the trail was washed away and we had to find a way to cross it. We enjoyed it a lot and weren't disappointed when we arrived at the lake. Summer is over - students are back in school. Now we are gettig busy for the workshops and presentations in the schools. 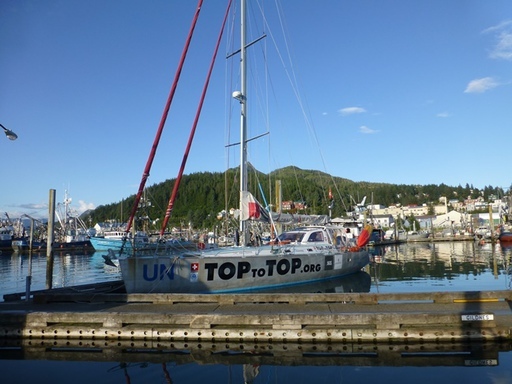 This video shows the TOPtoTOP Award Expedition 2010. The invited students from all over the world explored the positive climate solutions Switzerland has put into action and witnessed the devastating effect of climate change in the region. Now it's time for you to participate as well! The next expedition takes place from the 12th to the 25th of January 2014. Within sight from Pachamama, we can see the Science Center. Curious about what might go on in that building at the edge of the harbour, we decided to visit it and find out. What we found is an excelent example for the environment. 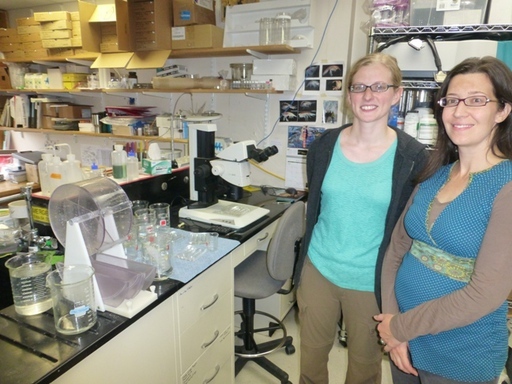 The Prince William Sound Science Center is a nonprofit organization, that its goal is to connect science to social and economic needs through education and engagement. 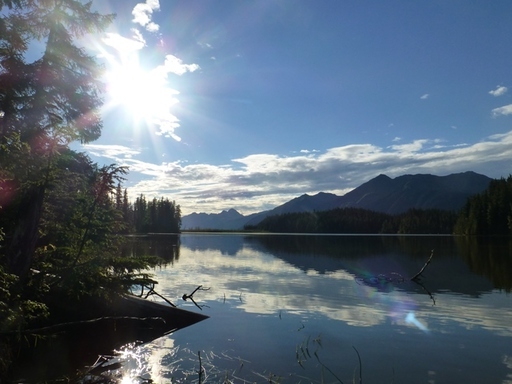 For that reason, they have research and education programms and collaborate with a lot of different organizations from Prince William Sound in order to protect the environment. 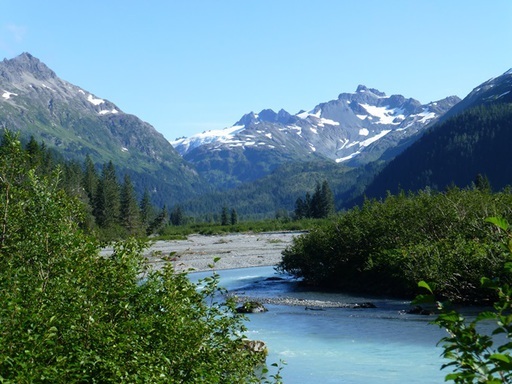 There is also a newspaper published, called „Delta Sound Connections" with articles about „the natural history an science news from Prince William Sound and the Copper River Bioregion" in it. They distribute the newspaper in the ferries, at the airport and other places, in order to give people that are new to the area information about "Oceans, Fish, Land and Sea, Ecosystem, Observing System, Education". On our hikes around Cordova, we met a lot of very nice people. So for example Jenny and Chris, that invited us more than once for lunch at their house. 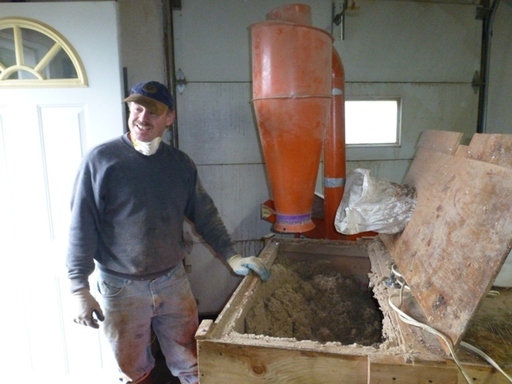 In their backyard, Chris showed us a machine, he uses to heat the house during the winter. It workes like this: He gets used cardboard from the grocery stores, cut it into smaller pieces and then puts them in a machine that makes little pellets out of it. With these pellets he can heat the house during the winter. Read the article send by Bryan regarding "Climate Change Has Reached Our Shores - NYTimes.com.pdf"! My time in Alaska on the boat is almost over, time to think about the last two months' that went by very quickly. - appreciation of sunny weather! - momories of great hiking! And if there are some "TopToTop-people" around, I would be more than happy to meet you! :).